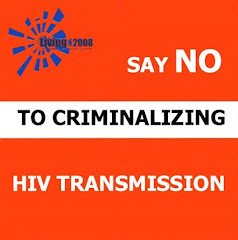 MEXICO CITY, 7 August 2008 (PlusNews) - In an attempt to stem the spread of the virus, African countries are increasingly passing legislation that criminalises HIV exposure and transmission. But these laws could do more harm than good, delegates attending the International AIDS Conference in Mexico, heard on Wednesday. "Africa has burst into this whole frenetic spasm of criminalising HIV," said South African Justice, Edwin Cameron. Laws that make HIV transmission an offence are nothing new in the developed world. In Switzerland, a man was sent to jail this year for infecting his girlfriend with HIV, even though he was unaware of his HIV status and a Texas court recently sentenced a man living with HIV to 35 years in prison for spitting on a police officer, although the chances the officer was exposed to the virus were virtually zero. Now African governments - particularly in West Africa - are jumping on the bandwagon. Four years ago, participants from 18 countries met at a regional workshop in N'djamena, Chad, to adopt a model law on HIV/AIDS for West and Central Africa. But the law that they came up with was far from "model", in fact Cameron described some of its provisions as "frankly terrifying". According to Richard Pearshouse, director of research and policy at the Canadian HIV/AIDS Legal Network, the model law's broad definition of wilful transmission could be used to prosecute HIV-positive women for transmitting the virus to their babies during pregnancy. The law also makes provision for compulsory HIV testing for accused rapists and for the settling of marital disputes; empowers healthcare workers to disclose a patient's HIV status to their spouse or sexual partner; and requires people with HIV to tell their partners as soon as possible or within six weeks of learning their diagnosis. Worryingly, at least seven countries in West and Central Africa have already used the model as the basis for their national HIV legislation, while at least six others are in the process of developing similar laws. Some countries have chosen to adopt the "model" law word for word, while others have attempted to simplify it, making the legislation "profoundly human rights unfriendly and human rights regressive", according to Pearshouse. Southern Africa, where the burden of HIV is the highest, has a mix of effective and ineffective HIV laws, but very few countries have so far introduced legislation that criminalises HIV transmission. However, Michaela Clayton, executive director of the AIDS and Rights Alliance of Southern Africa, told delegates that in Malawi, a bill with very broad provisions for criminalising transmission, including from mother-to-child, is currently being debated. If found guilty under the proposed law, an HIV-positive person could face imprisonment of up to 14 years. Mozambique is considering passing similar legislation. "Bad laws can spread the virus"
Speakers agreed that the intentional and malevolent infection of another person is a criminal offence, but warned about the difficulty of drawing a line between criminal and non-criminal transmission. Julian Hows, from the Global Network of People living with HIV/AIDS, urged delegates to consider the effect of criminalisation laws on HIV-positive people. He said they created "fear and confusion" and made people living with the virus feel like criminals. "Criminal law is simply the wrong framework for dealing with HIV transmission," Cameron commented. "Everywhere it has been tried, it has been counterproductive and applied unjustly." Instead of preventing HIV, criminalisation fuels stigma and discourages people from getting tested, disclosing their status to partners or accessing treatment. Criminalisation is often positioned as a way of protecting women, but Clayton pointed out that because women test for HIV in greater numbers than men, it is women who were more likely to be arrested and prosecuted. She also warned that the laws would create mistrust between people living with HIV and health care providers. "Just like faulty condoms or unsafe medical supplies, bad laws can spread the virus," Cameron said.